What if I told you you could have a modular with what would feel like limitless possibilities – and it’d cost just a couple hundred bucks. Oh, yeah, and if you got bored of the existing modules, you could make new ones. Well, that’s exactly what you get with Blocks in Reaktor 6. And, while, sure, you could say the same of past versions of Reaktor could say that, too, as could tools like Max or SuperCollider or Pd, here we mean literally a set of modules that inter-connect in real-time, act as self-contained units, and allow designers to create their own sonic innards and front panels. And that hasn’t been true before – not quite like this. Let’s back up. Part of the promise of modular synthesizers is supposed to be unlimited freedom. But in reality, modulars aren’t quite that. You need space. You need money. And even assuming you’ve got electronics chops, dreaming up new modules is not something you can do on the spot. Reaktor has clearly learned something from Eurorack modular. Like the hardware, Blocks are standard modules with specific purposes in mind. Like hardware, they have a particular look, feel, and personality – they aren’t just generic signal operators, but feel like the components of an instrument. Of course, these do some things that modules can’t. You can open them up and change any part of the innards, down to the DSP level. You can spawn any number of modules (until your CPU – or your brain – tell you otherwise). And you get all the usual power of your computer. Bento Box: The core components of a modular synth. Boutique: Inspired by custom hardware, with various more bleeding-edge sound shaping powers. Digilog: Rhythms, note processors, and structures – like the step sequencers. All-Star Blocks: These actually take your favorite bits of Reaktor synths like Rounds and Monark and turn them into modules, too. That’s all very cool, already, and recalls environments like AAS’ underrated, underused Tassman modular software. But the most important lesson Blocks may learn from Eurorack is making a format that other inventive folks can use themselves. “Blocks” isn’t just some marketing speak for these included modules: it’s also a new template for how to make your own Reaktor stuff. It divides your work into Panel and Structure, but also specifies standardized panel sizes (as you would with hardware), and prescribed structural conventions. 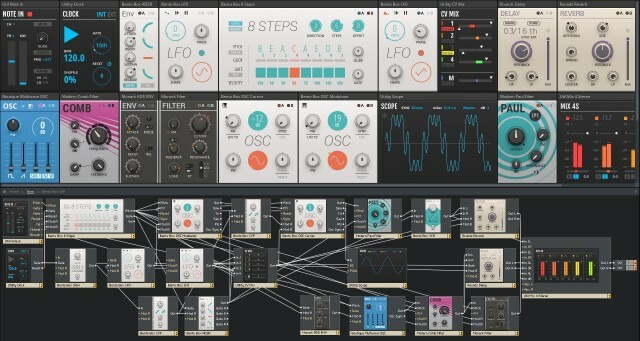 That’s huge, as previously working with bits and bobs from the Reaktor library would mean mismatched panel sizes and confusion about how to navigate the inner workings of a creation. Also, Blocks are easier to inter-connect. Scaling, audio and control rate, and signal conventions are standard, too. That means as an end user, you can freely plug different modules into others and always get some musical result, in real-time – perfect for happy accidents. I think this is actually part of what sometimes makes computers less fun to patch than hardware. Patching is only fun if you feel free to patch where you like. CDM was provided advance guidelines for how the format would work, and it’s very cool – it could really make the Reaktor User Library a whole lot more powerful. Do a little reading of how to follow the guidelines, and make use of NI’s template file, and builders can make their own Blocks. That means as powerful as Blocks is today, it’s likely to be a whole lot crazier in a matter of … well, weeks, even? If you’re a builder, it’s big news, and even if you’re not, you’re likely to find new goodies to download from other users. 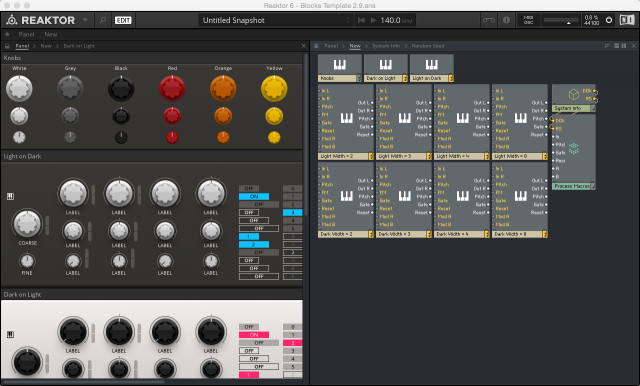 Blocks aren’t the only thing new in Reaktor 6 (see our separate visual tour for more on that). But they neatly embody the vision of this new generation of Reaktor. If you’ve already got Eurorack hardware, you can integrate a Reaktor setup with it (even routing signal back and forth if you choose). And if you don’t, creative modular sound design just got a whole lot more accessible. You won’t even have to clear your desk.